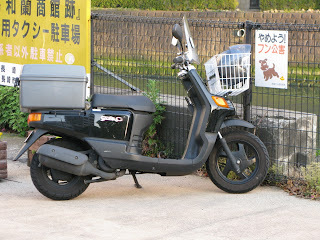 Picked up this wonderful magazine in Nagasaki. 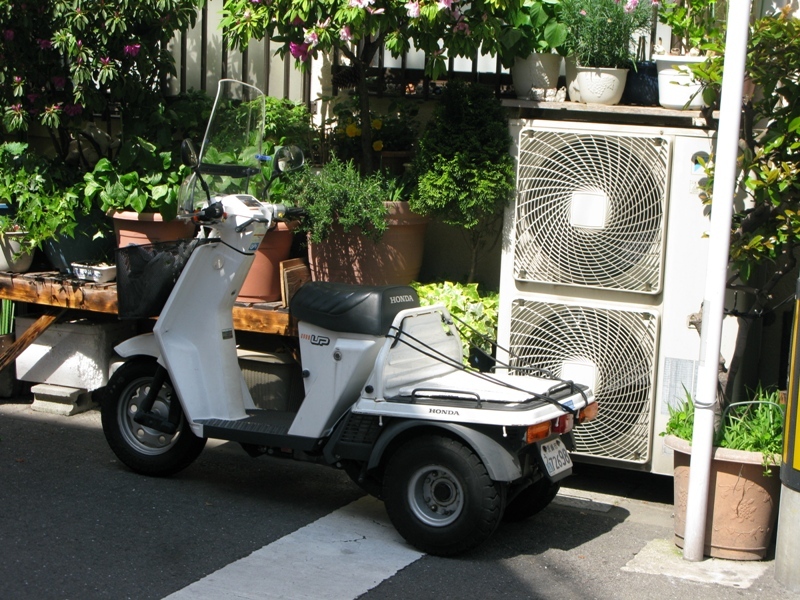 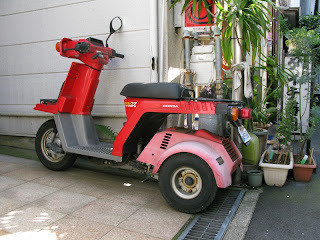 It's about Bosozoku (biker gang) style bikes. 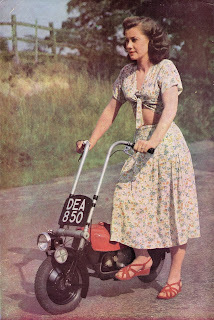 I can't work out anything about it but just know it is a feast for the eyes. A completely different style aesthetic for European sensibilities. 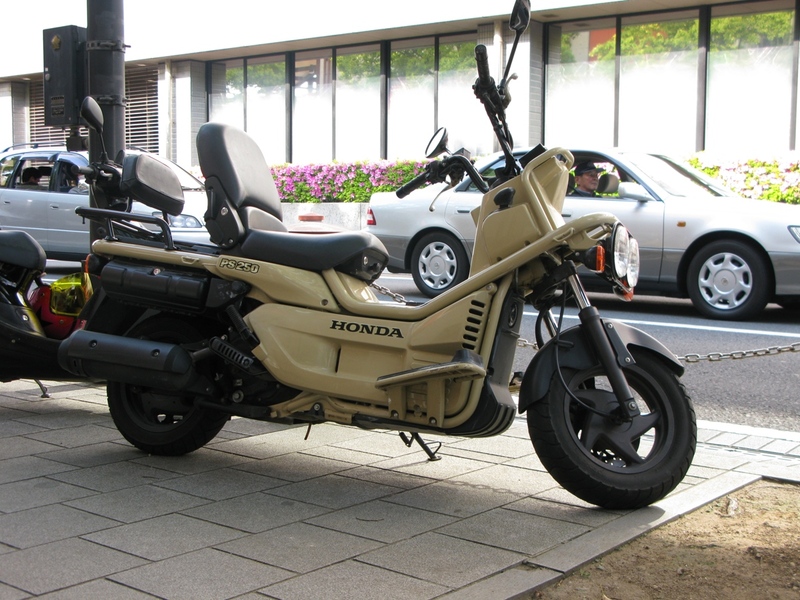 Bikes are largely 80s Japanese, style is half cafe racer, half chopper: ape hangers, wild exhausts, dolphin fairings and way out paint schemes with lots of rising sun motifs. 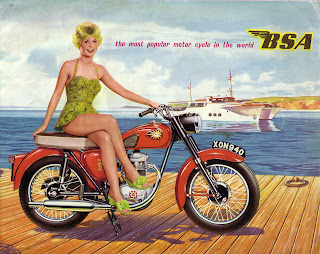 Girls are out in force on the bikes too and there's a whole fashion scene going along with it. 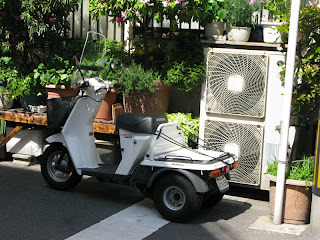 Makes me want to create a bosozuku style bike back at home but not sure I would have the balls to ride it out and about! 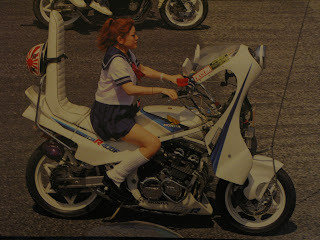 Foxy lady on 80s Suzuki! Custom Honda Fusion ticking many of the boxes. 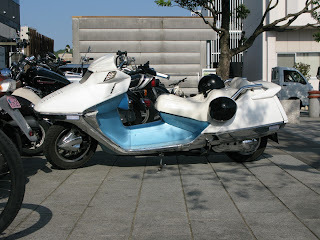 Not modified, but an oddity worthy of inclusion - Honda PS250. 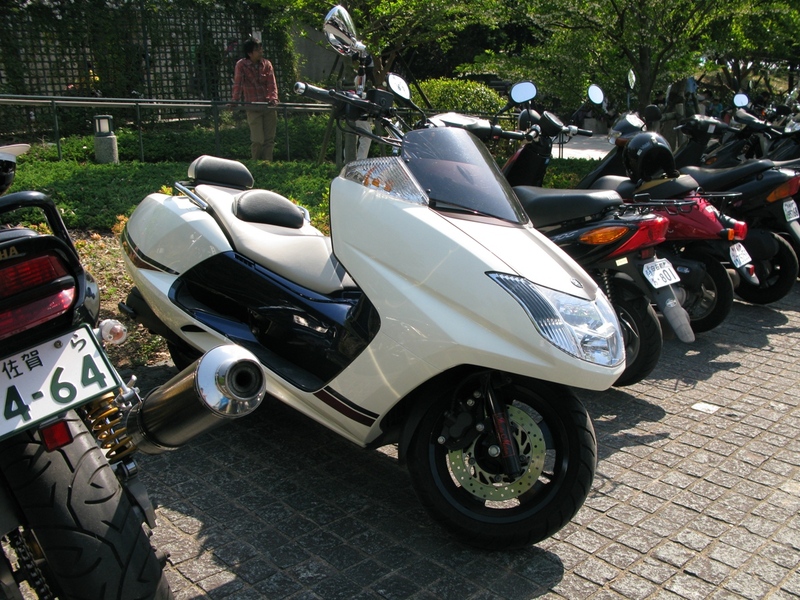 scale up is a bit clunky. 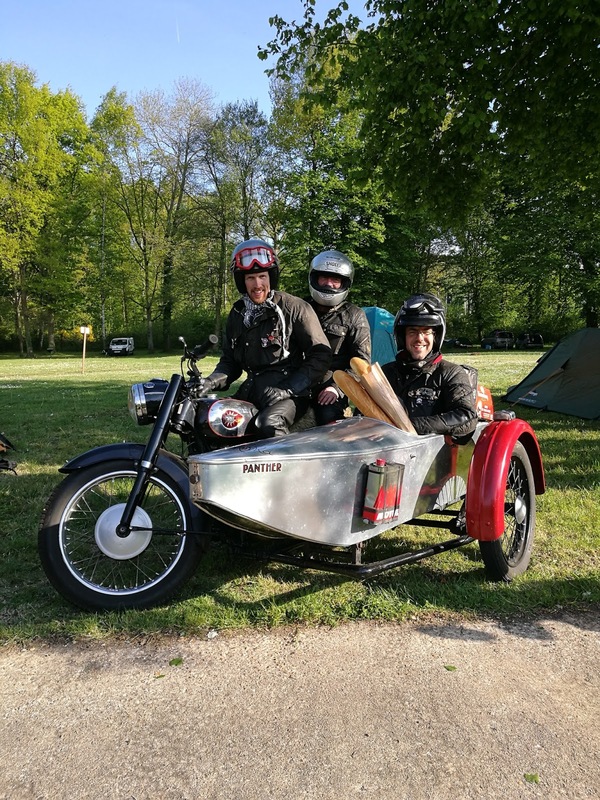 kit on. I would guess Suzuki. 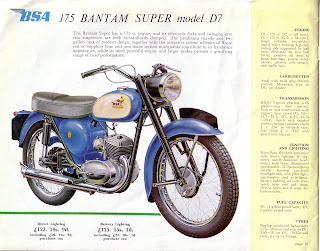 Looks great anyhow. 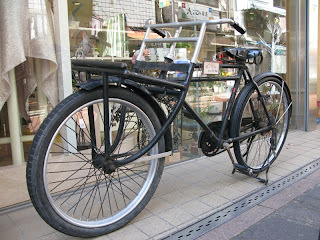 Another view of the above. 1938 Levis Motor Cycles brochure front cover. 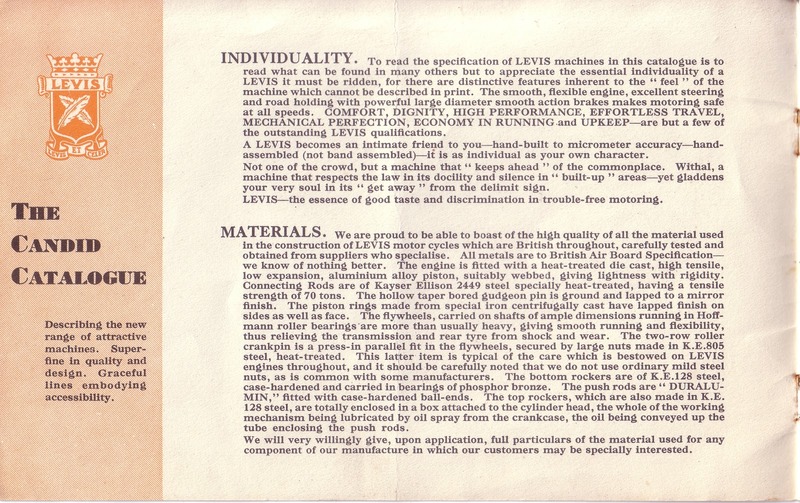 1938 Levis Motor Cycles brochure page 1. 1938 Levis Motor Cycles brochure page 2. 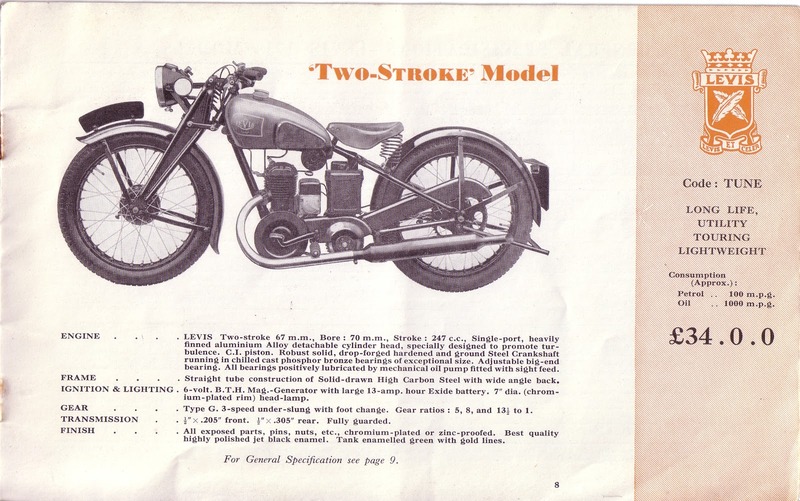 1938 Levis Motor Cycles brochure page 3. 1938 Levis Motor Cycles brochure page 4. 1938 Levis Motor Cycles brochure page 5. 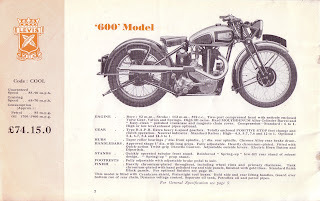 1938 Levis Motor Cycles brochure page 6. 1938 Levis Motor Cycles brochure page 7. 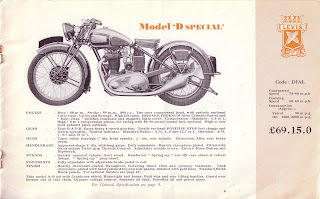 1938 Levis Motor Cycles brochure page 8. 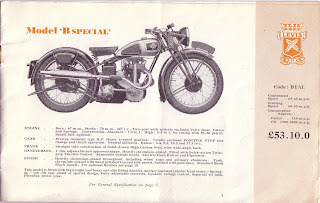 1938 Levis Motor Cycles brochure page 9. 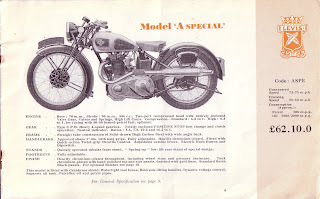 1938 Levis Motor Cycles brochure page 10. 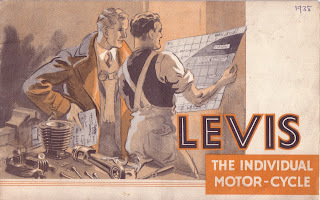 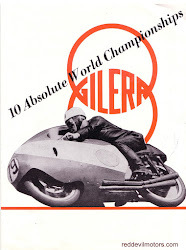 1938 Levis Motor Cycles brochure rear cover. Period photo of an early thirties ohc Norton. There's folks out there could readily identify it but I'm pressed to recognise one model of cammy Norton from the other..
A real obscurity here. 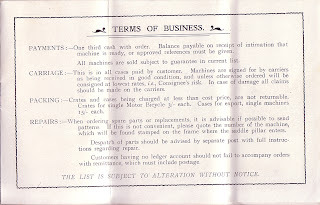 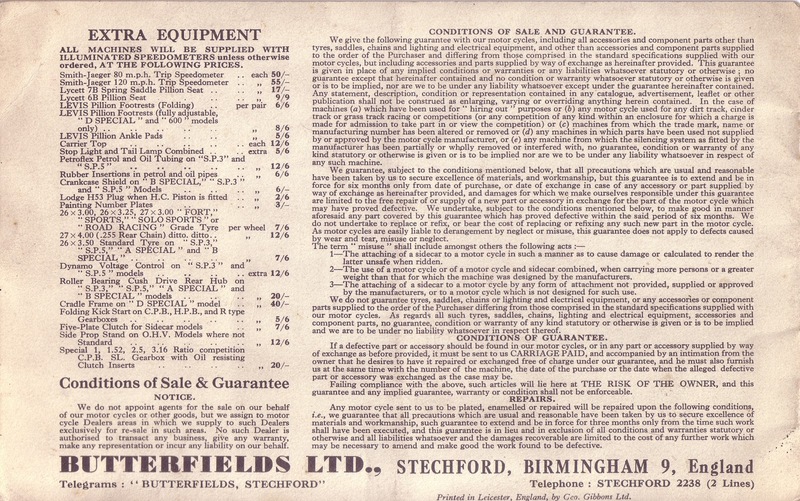 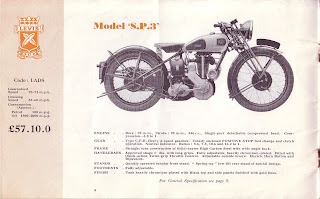 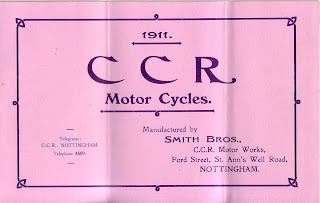 I can't find out anything about CCR Motor Cycles (Smith Brothers) other than what is in the brochure. 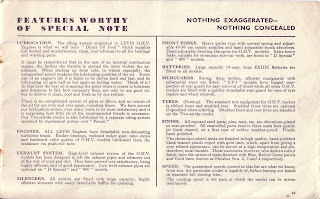 There's an entry in the Grace's Guide but it is brief and a little conjectural. 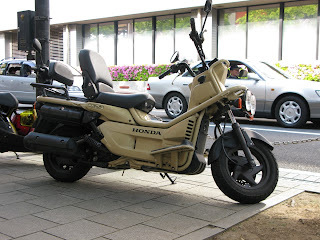 I doubt there is a survivor, would be great to hear otherwise. 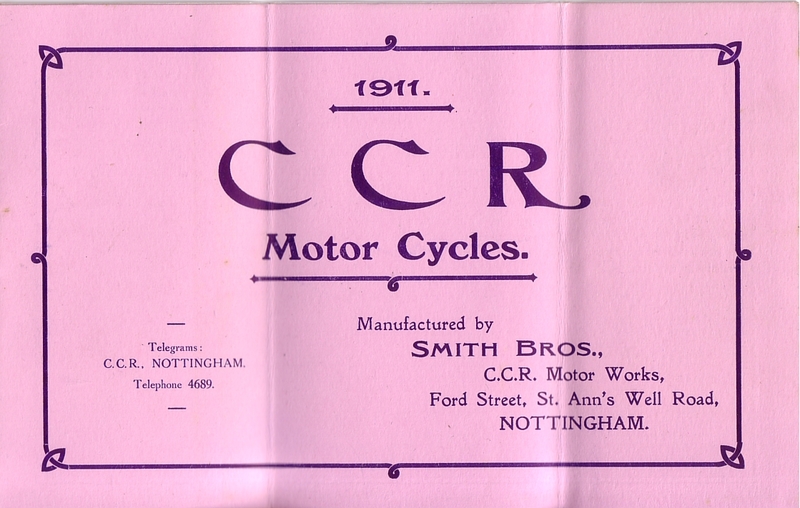 CCR Motor Cycles 1911 brochure front cover. 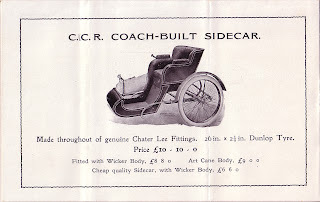 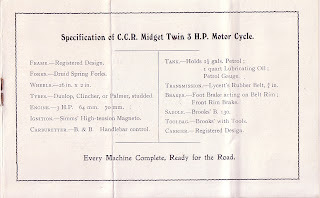 CCR Motor Cycles 1911 brochure page 1. 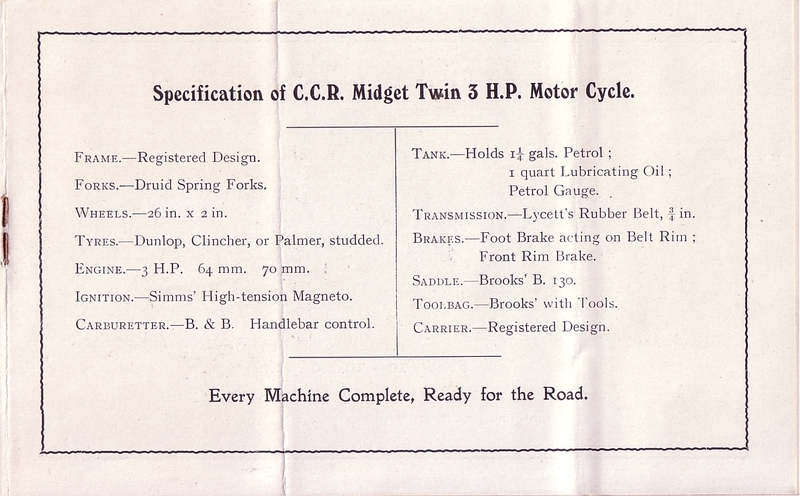 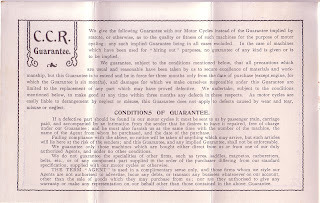 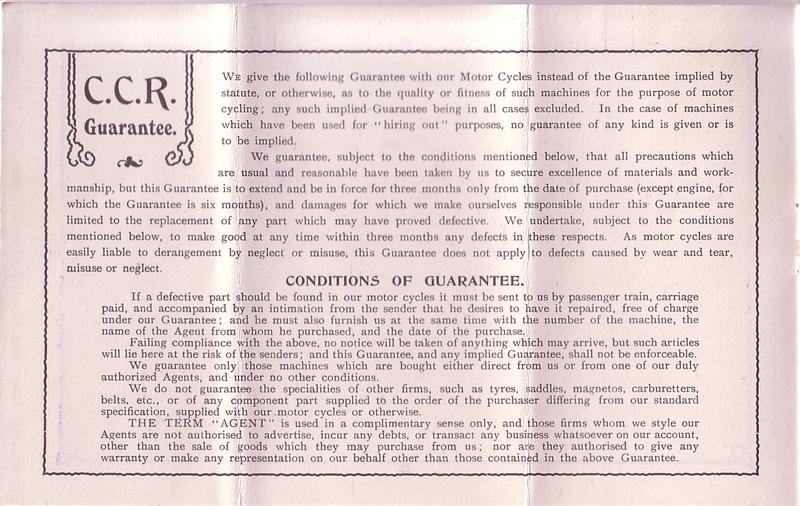 CCR Motor Cycles 1911 brochure page 2. 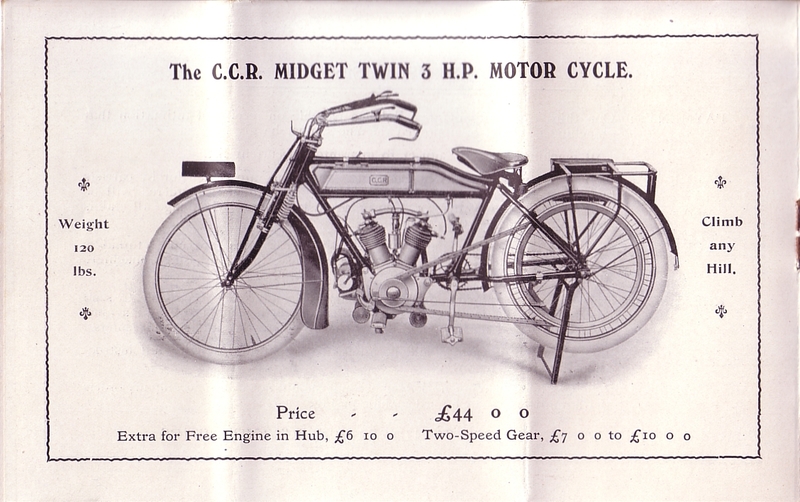 CCR Motor Cycles 1911 brochure page 3. 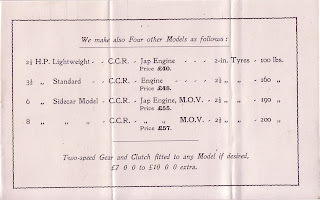 CCR Motor Cycles 1911 brochure page 4. CCR Motor Cycles 1911 brochure page 5. 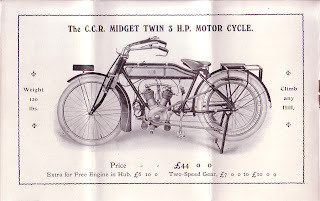 CCR Motor Cycles 1911 brochure page 6. 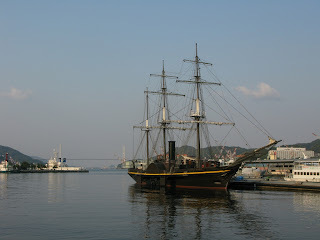 Kanko Maru paddle steamer moored up in Nagasaki. 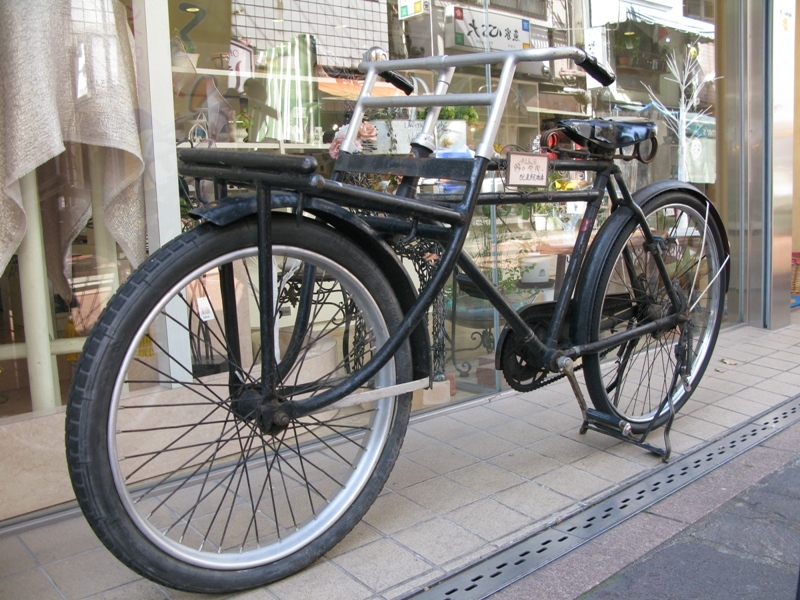 It's a two wheeler of sorts... Not really usual subject matter for this blog but if you like dodgy old bicycles and motorcycles then you must like paddle steamers too, maybe. 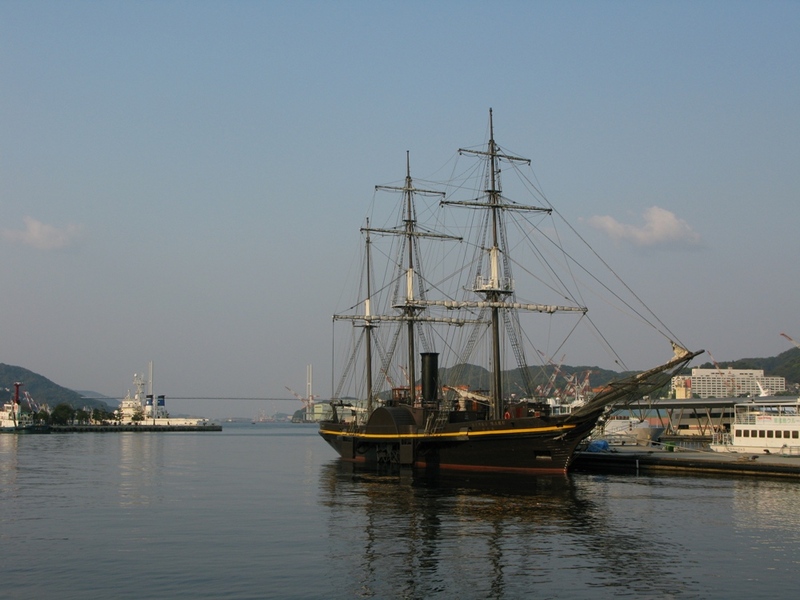 The Kanko Maru was Japan's first warship and was presented to the country by the Dutch in 1855. The boat currently plying the coast of Japan with a cargo of tourists is a replica built in Holland in 1987. 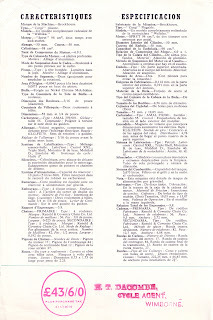 Full history of the vessel on Wikipedia. Here's an unusual photo. 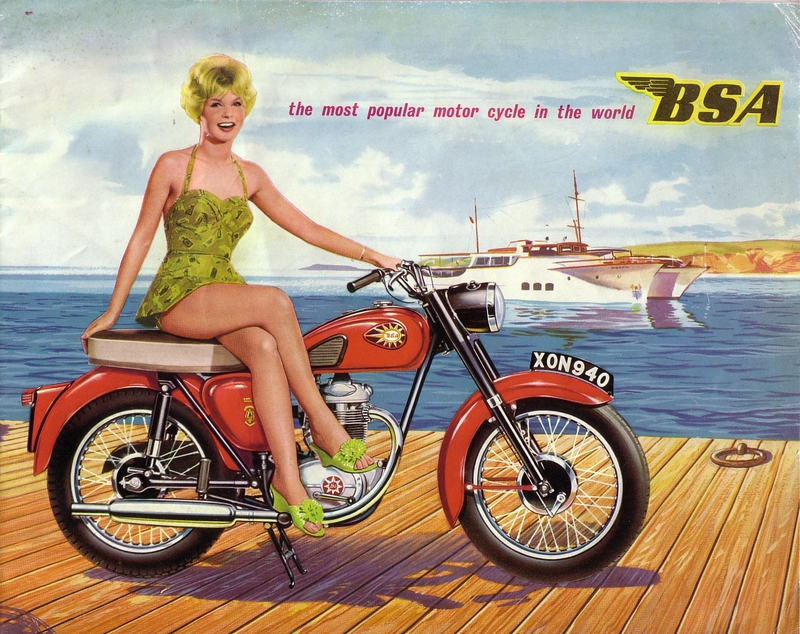 It's a Seal Sociable. Made from 1912 to 1924 in, presumably, very limited numbers. 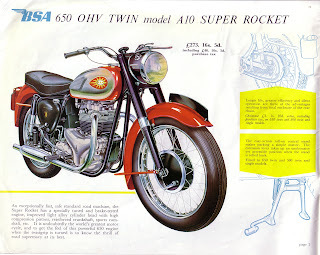 It must have seemed like a logical idea at the time - most big v-twins were made to haul sidecars so why not combine the two together and allow rider and passenger to sit side-by-side? 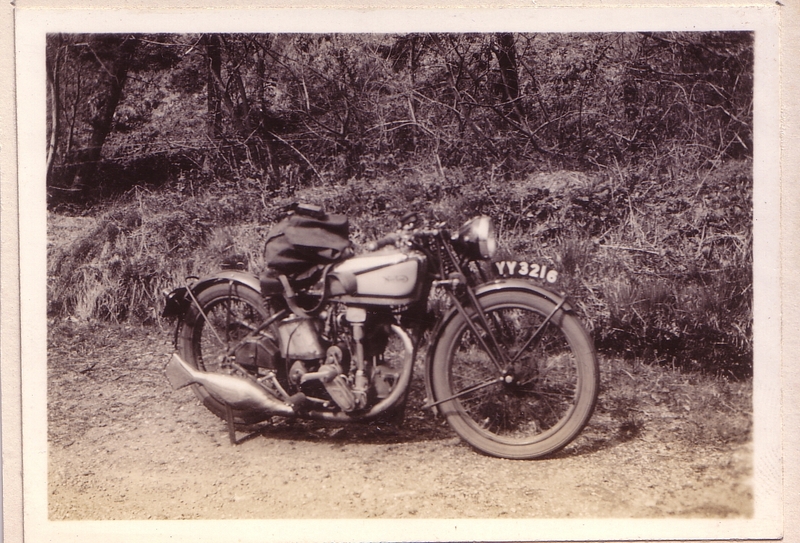 It is powered by a JAP v-twin and at least one survives, in the National Motorcycle Museum. 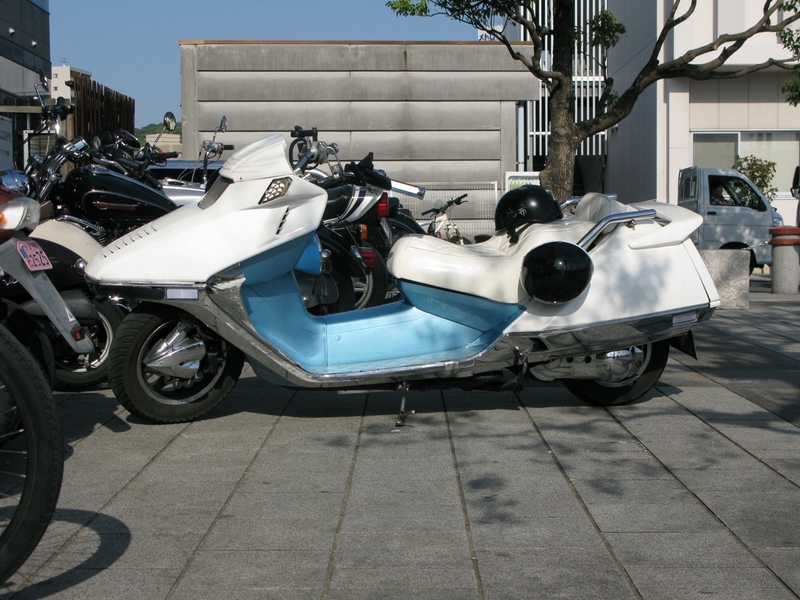 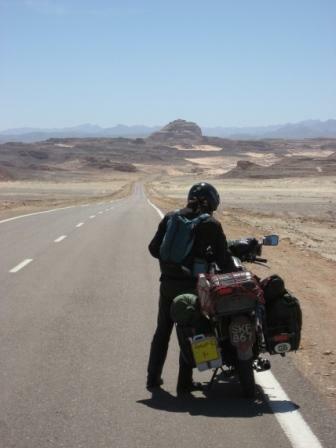 Strangely the sidecar in this picture is on a different side from other pictures I have seen. 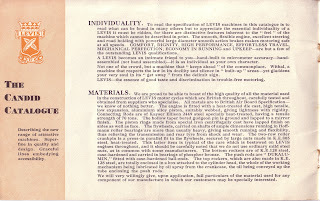 They must have made left and right hand versions. 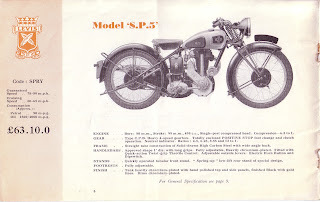 The machine might be a studio prop as was popular at the time, but it would have been quite an expensive device for a studio to own. 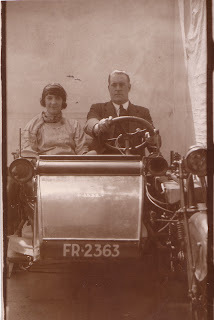 Perhaps this couple are in fact the proud owners. 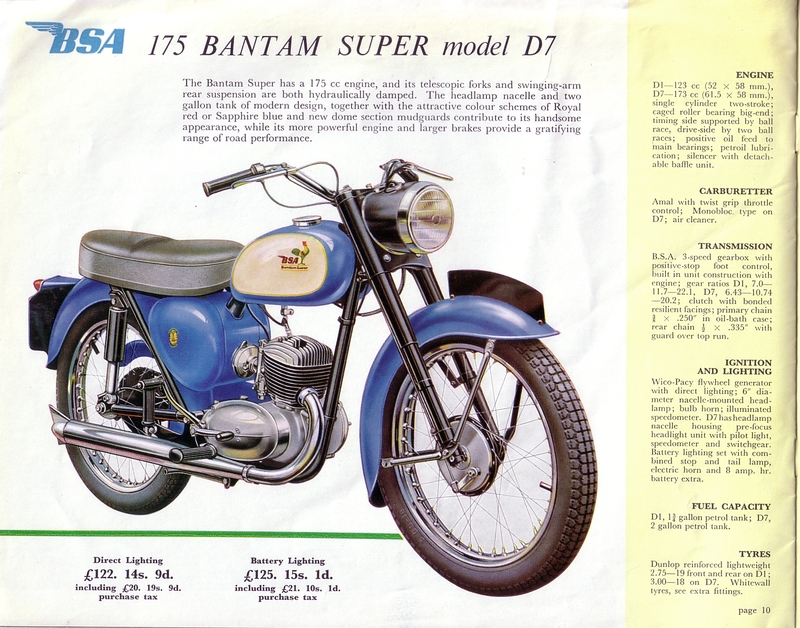 A lovely utopian BSA brochure showing the 1960 full range. 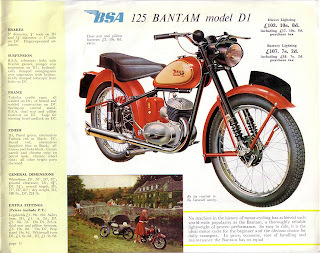 From the days when BSA was full of confidence, largely ignorant of the storm clouds gathering and could rightly claim to be 'the most popular motorcycle in the world'. 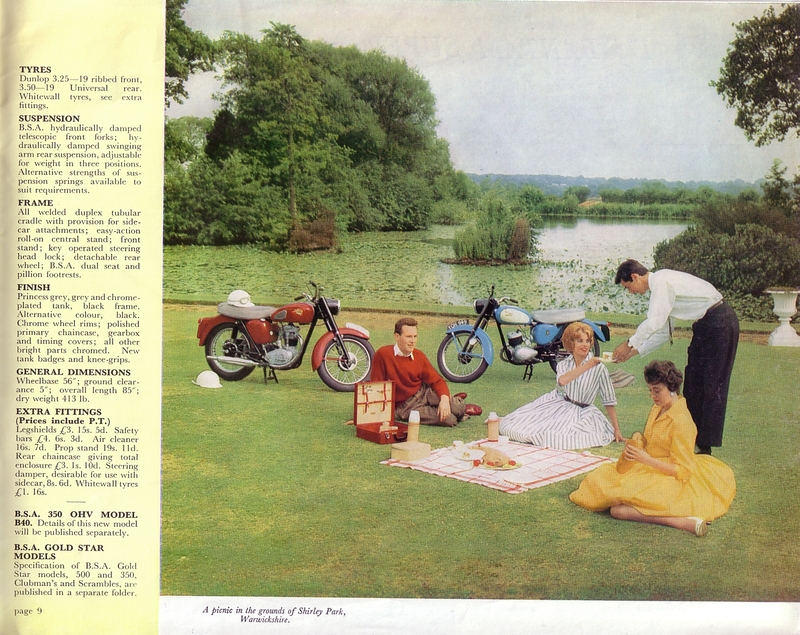 Full of wonderfully wholesome images and quiet to the realities of sixties motorcycling of dull commuting, stinky waxed jackets and knackered cafe racers and all the better for it. 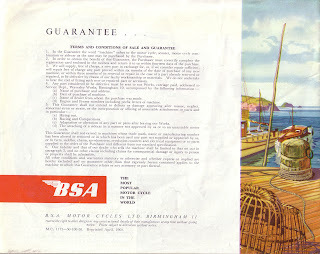 1960 BSA Motorcycles brochure page 1. 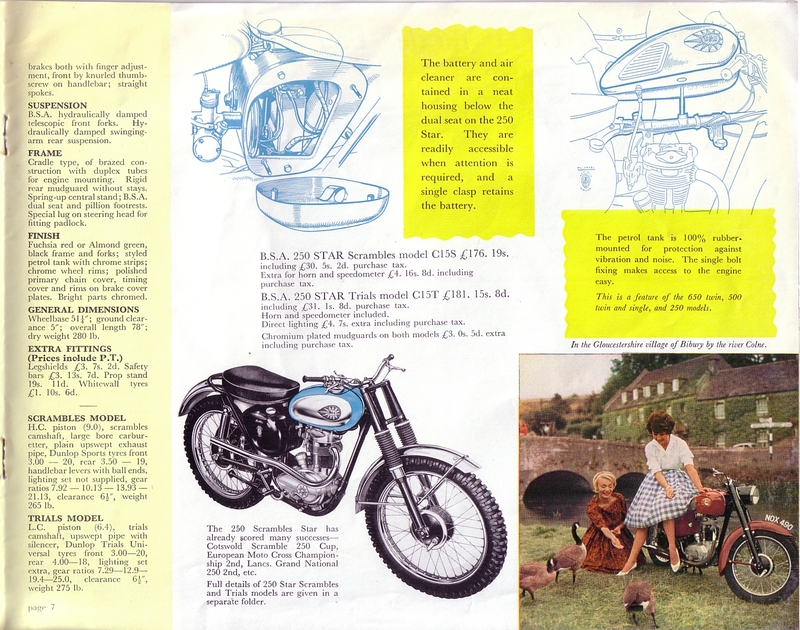 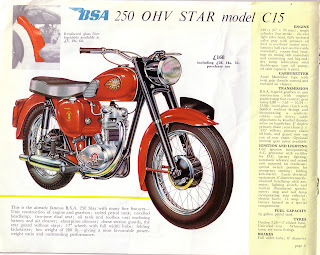 1960 BSA Motorcycles brochure page 2. 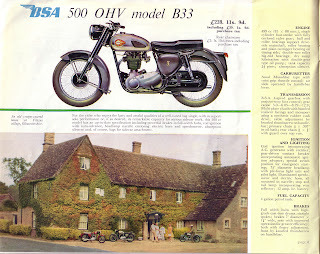 1960 BSA Motorcycles brochure page 3. 1960 BSA Motorcycles brochure page 4. 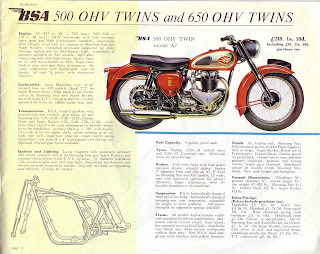 1960 BSA Motorcycles brochure page 5. 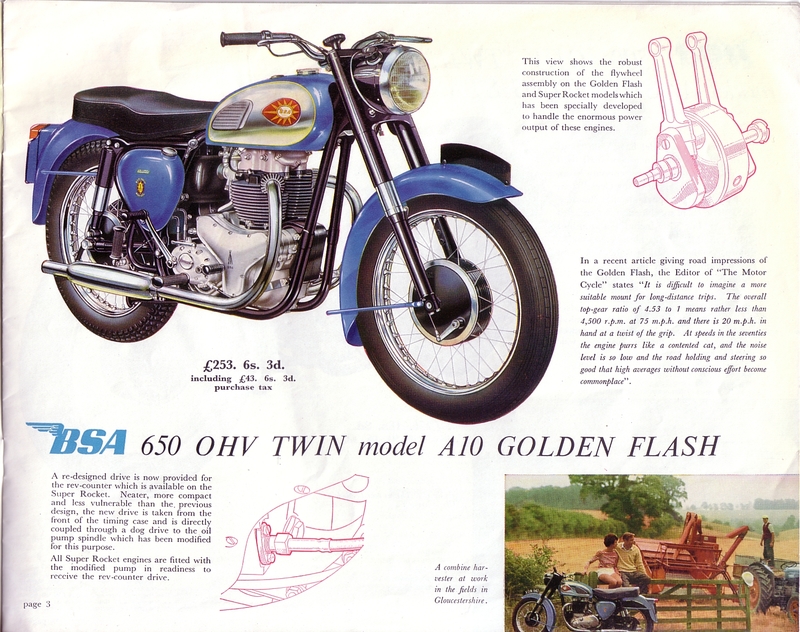 1960 BSA Motorcycles brochure page 6. 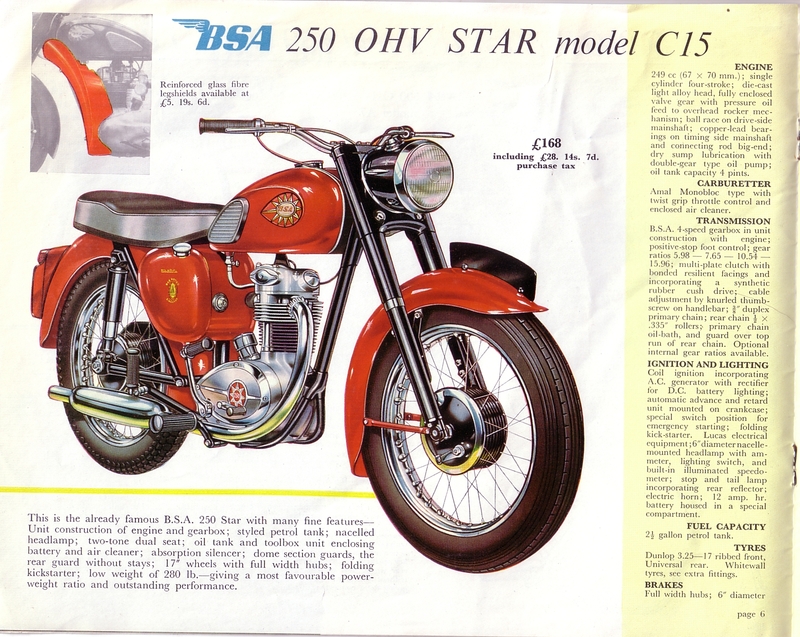 1960 BSA Motorcycles brochure page 7. 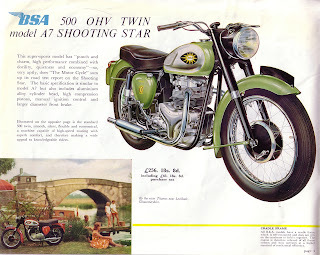 1960 BSA Motorcycles brochure page 8. 1960 BSA Motorcycles brochure page 9. 1960 BSA Motorcycles brochure page 10. 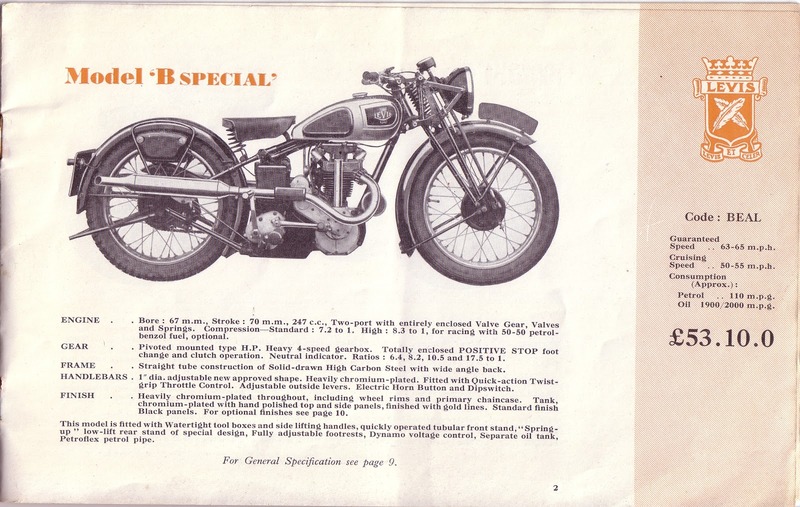 1960 BSA Motorcycles brochure page 11. 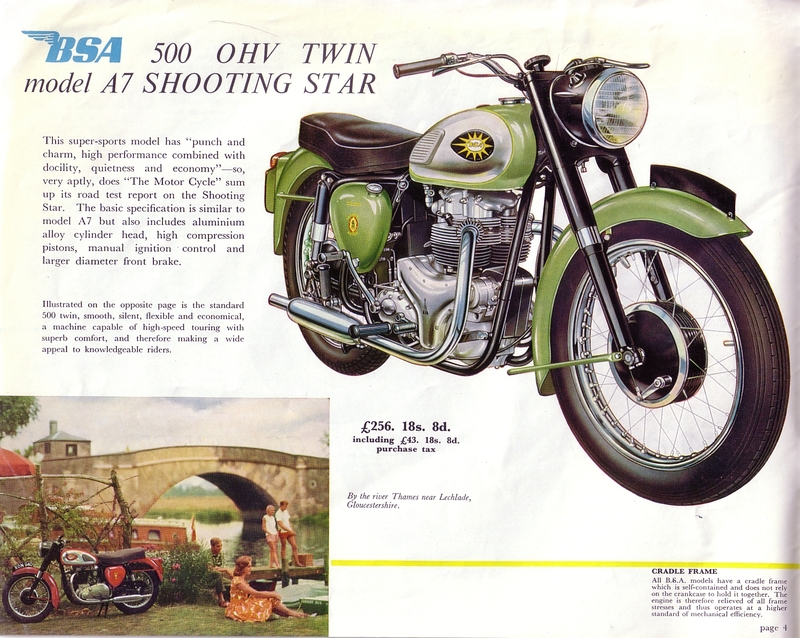 1960 BSA Motorcycles brochure page 12. 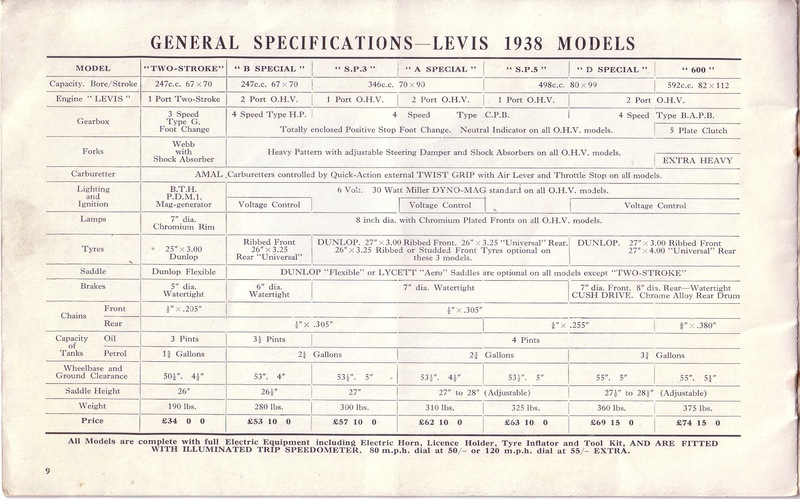 The UK Government announced in this years budget that from 1 April 2014 the Vehicle Excise Duty exemption for classic vehicles will roll forward by one year to cover all vehicles manufactured before 1 January 1974. 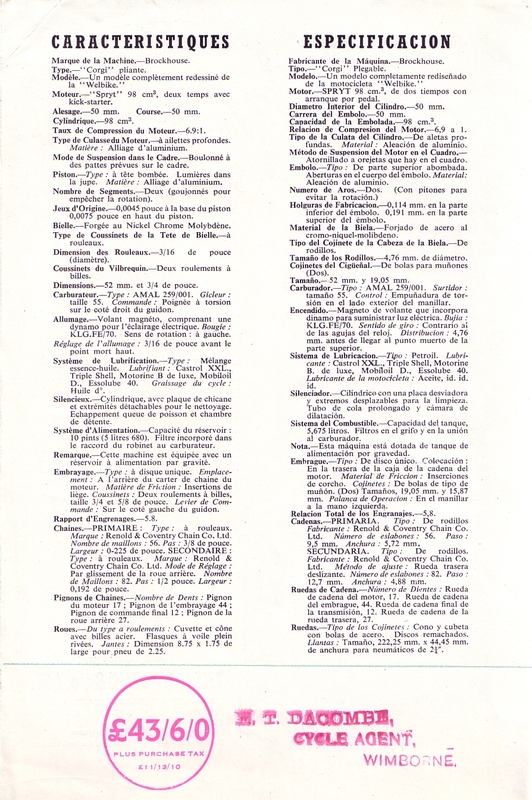 This is covered by Budget Document 2.148 VED: here's the official Budget pdf. 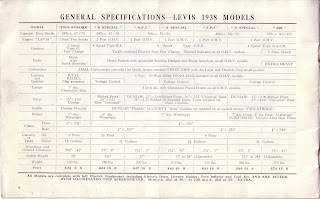 (If you're desperate to find the clause, press control & s and search classic vehicle). 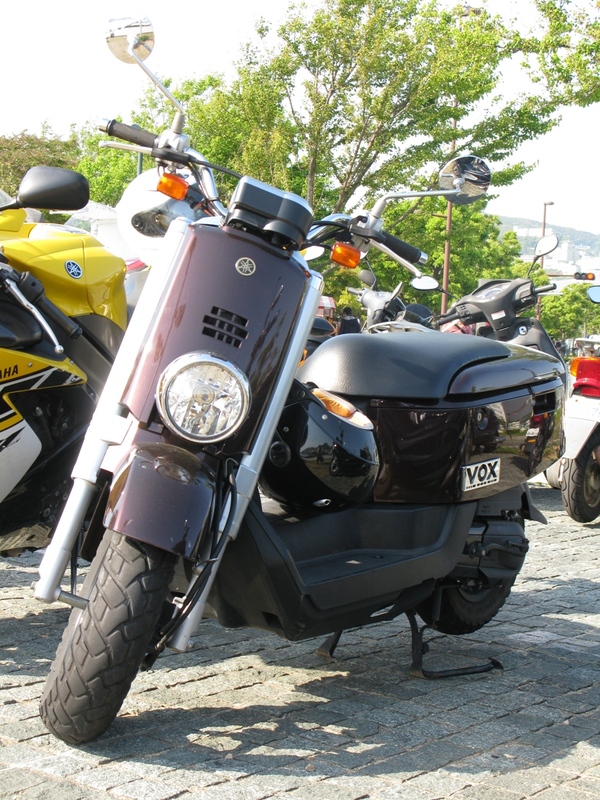 Will it mark the return of a year on year rolling exemption? 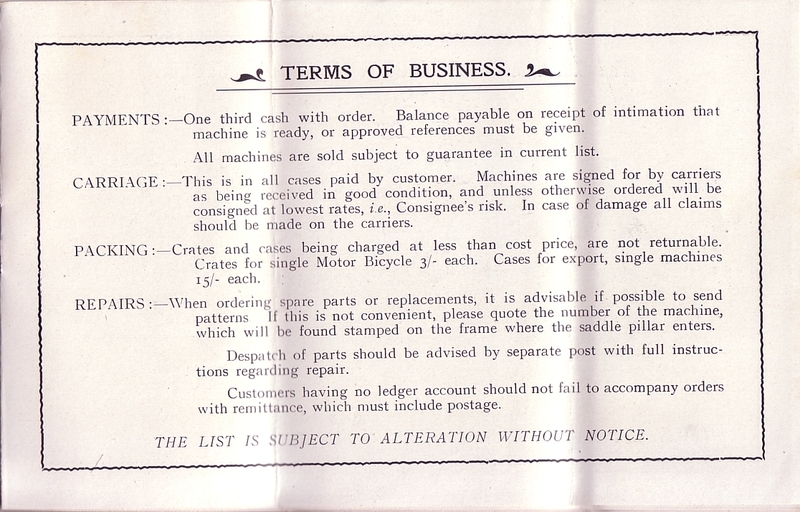 Would make sense to fix it at forty years. I think when they first brought out the rolling twenty five year rule they had underestimated just how many old clunkers were on the road and how much money they were missing out on, hence the freeze. 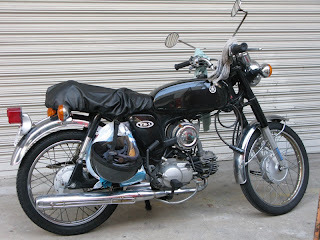 Nowadays there's few vehicles more than forty years old used as sole transport. 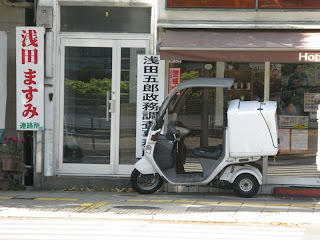 Honda Gyro Canopy delivery tricycle. 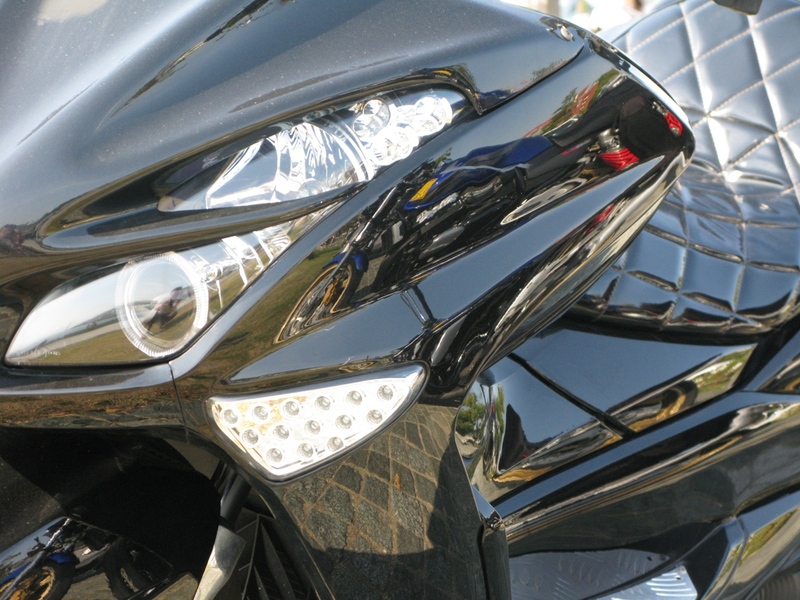 continuously variable transmission and limited slip diff for loose surfaces. front wheel) but the flipside is it will steer like an absolute pig. 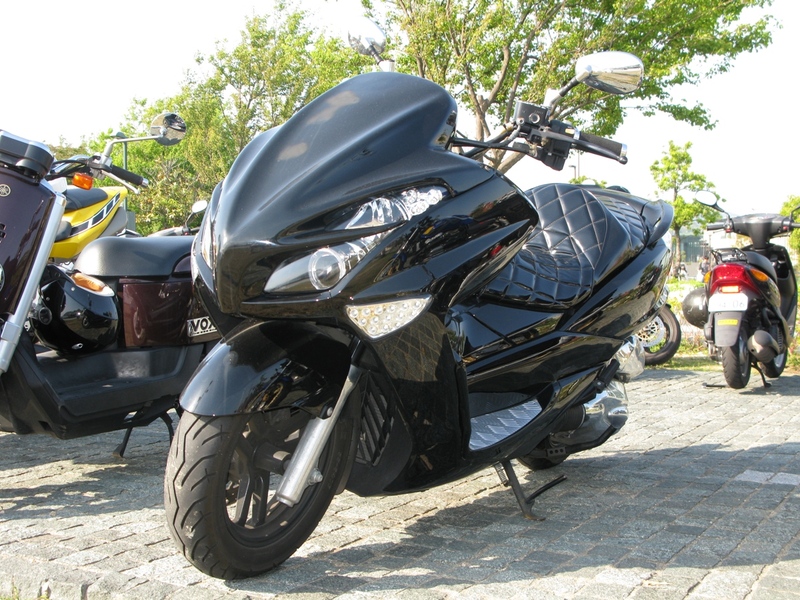 Another Gyro X but a newer model. 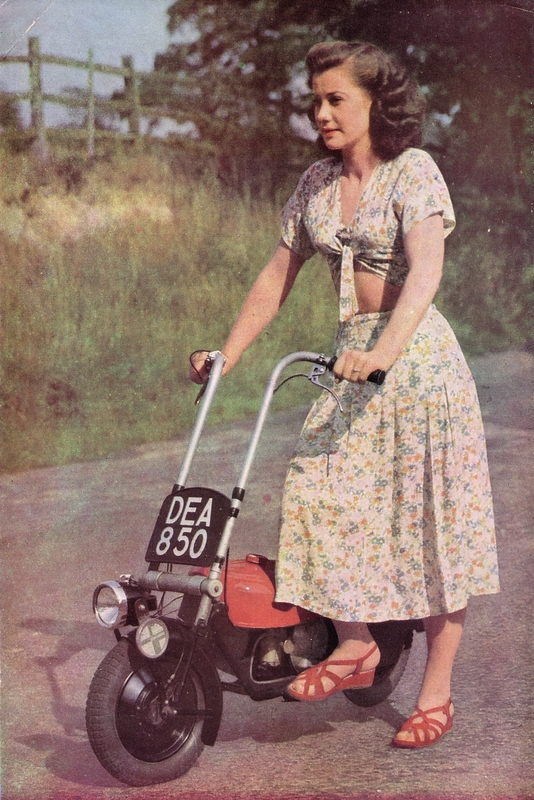 A charming brochure for the 1950 British made Corgi folding scooter. 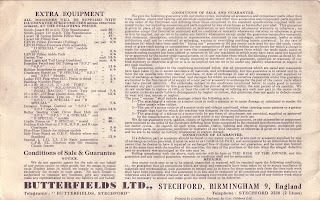 Unusual to see a multi-lingual brochure, perhaps they were anticipating strong export sales or perhaps, and more probably, they didn't have the budget for completely separate translated brochures. 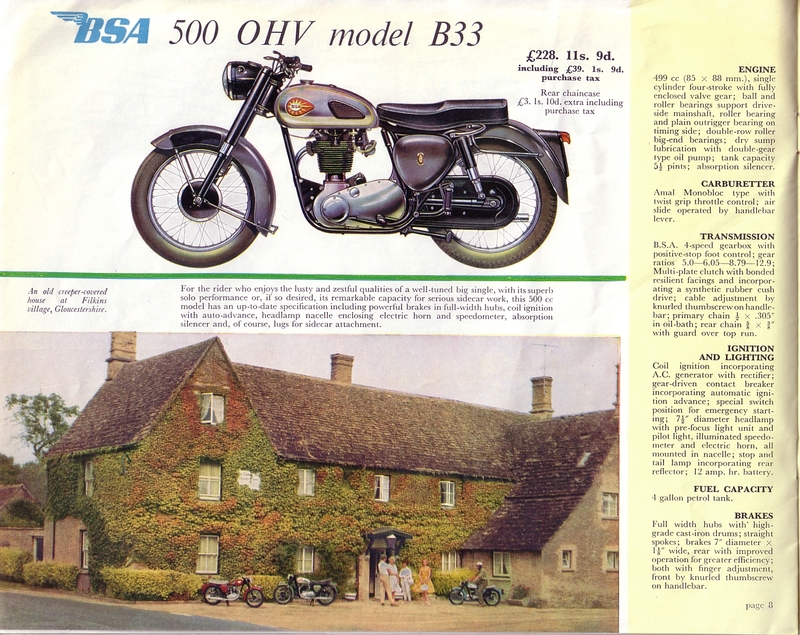 As a total aside the shop which has stamped the brochure, Dacombe Cycle Agent of Wimborne features in the Wimborne Minster model town to this day! 1950 Corgi brochure front cover. 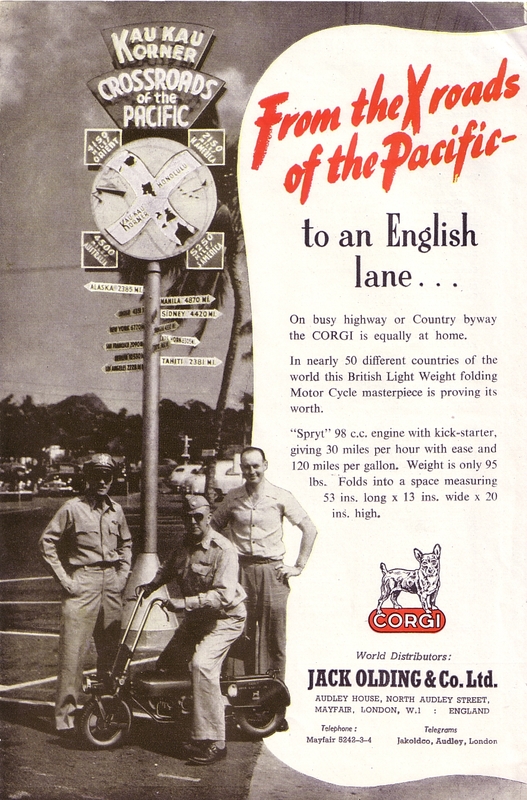 1950 Corgi brochure page 1. 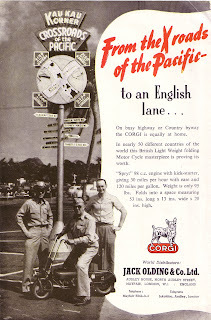 1950 Corgi brochure page 2. 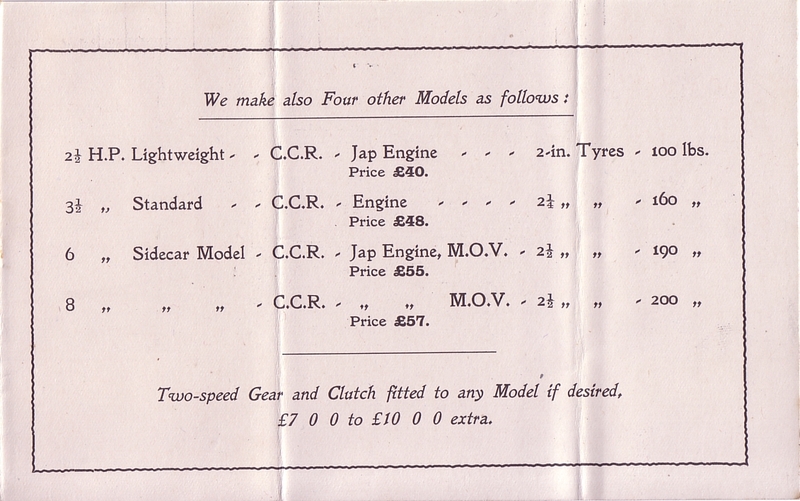 1950 Corgi brochure outer flap. 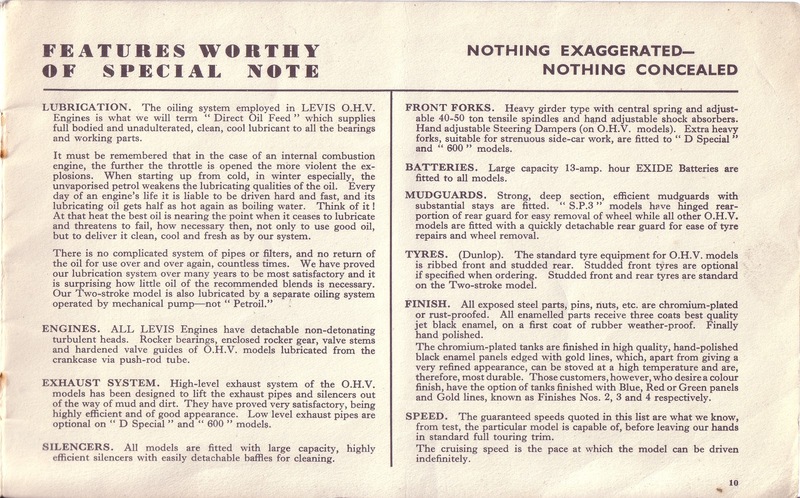 1950 Corgi brochure inner flap. 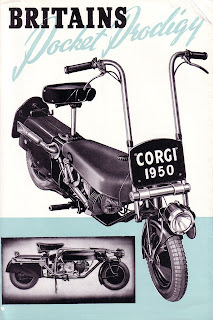 1950 Corgi brochure rear cover.